I LOVE sushi. Like I have said in my previous posts before, if I could eat it everyday I absolutely would. The price? Not so much. The work that comes with it if you decide to make it at home? Don’t even get me started. So, because of my cheap and lazy bad habits, alas the sushi bowl was born. This sushi bowl is essentially a deconstructed sushi roll except without the fuss and mess of the rolling and cutting. Plus, you can put anything and everything in the bowl all at once and not have to worry about “Oh man is this roll going to fit in my mouth?’ ‘How the hell am I going to roll this bad boy?” I mean honestly, nothing is more embarrassing than you trying to eat half of a sushi piece and it falling apart all over your face. You start cursing the sushi chef or you probably just have a hole in your mouth. In that case, Ew, please pull yourself together! It’s so simple. Once your rice is cooked and seasoned, you’re done. It’s as simple as making a sandwich. Writing this blog post took longer than actually making the bowl itself! 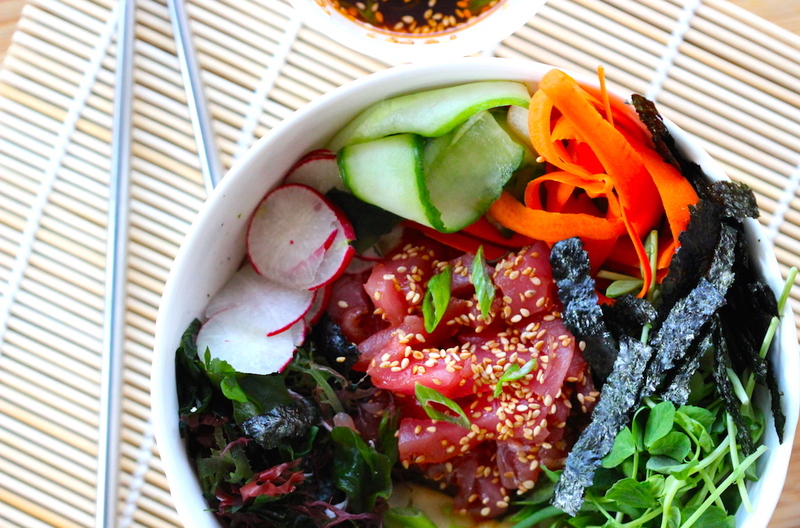 Get all your ingredients ready, put everything in a bowl and bam sushi bowl. You can use brown rice, quinoa, or any other grain that you like, just remember to season it. 🙂 As for the toppings? Go wild if you want. You can make it vegetarian, strictly fish, even chicken if you want (Even though that would defeat the purpose of the “sushi” bowl and I would totally roll my eyes if someone used chicken, so even though I said it was okay, it’s not. But that’s none of my business) 🙂 I like to stick with some of the traditional vegetables and fish found in sushi. But everything is optional, so by all means go rogue just don’t tell me you used chicken. Keep that between you and yourself… please. So, yeah be lazy. It’s okay! 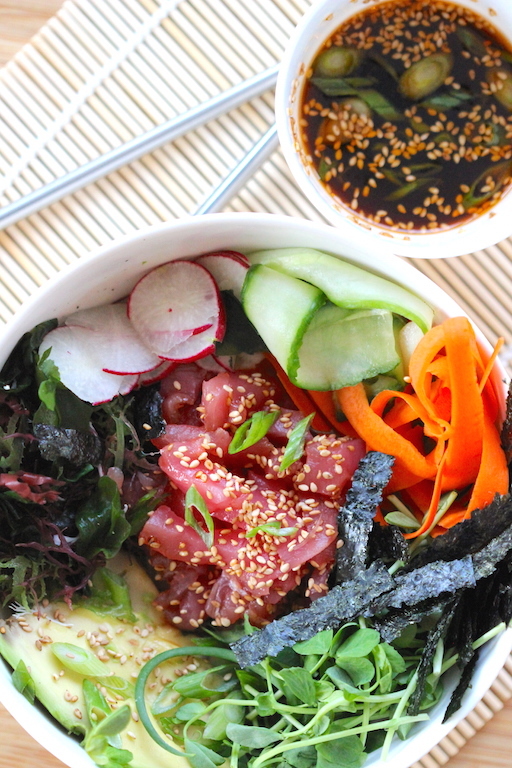 Make sushi bowls and eat them while you are having a 10-hour Netflix watching spree. There is absolutely nothing wrong with that. Cook the rice in a rice cooker according to the manufacturers instructions. Alternatively, in a medium saucepan, comebine the rice with 2 cups of cold water and bring to a boil over high heat. Cover and cook over moderate heat for 10 minutes. Reduce to low and cook for 10 minutes longer. Remove from the heat and let stand, covered for another 15 minutes. Meanwhile, in a small saucepan, combine mirin, rice vinegar, sugar and salt over medium heat, stirring to dissolve the sugar. Transfer the rice to a large bowl, sprinkle ½ cup of the seasoning all over the rice and a little on the spatula while mixing. Use a slicing motion with the spatula, gently separate the rice grains while mixing in the seasoning. Fan the rice while mixing it to help dry. Once done, cover the rice with a damp towel. 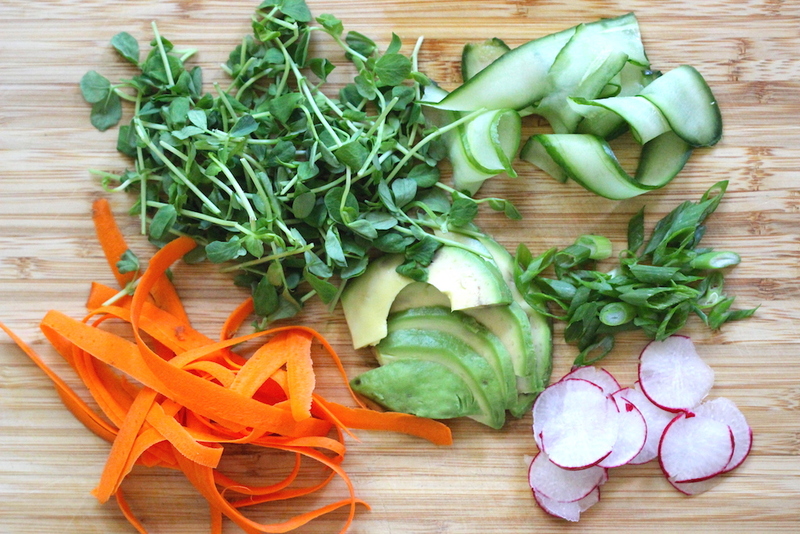 Prep all the vegetables and set aside. 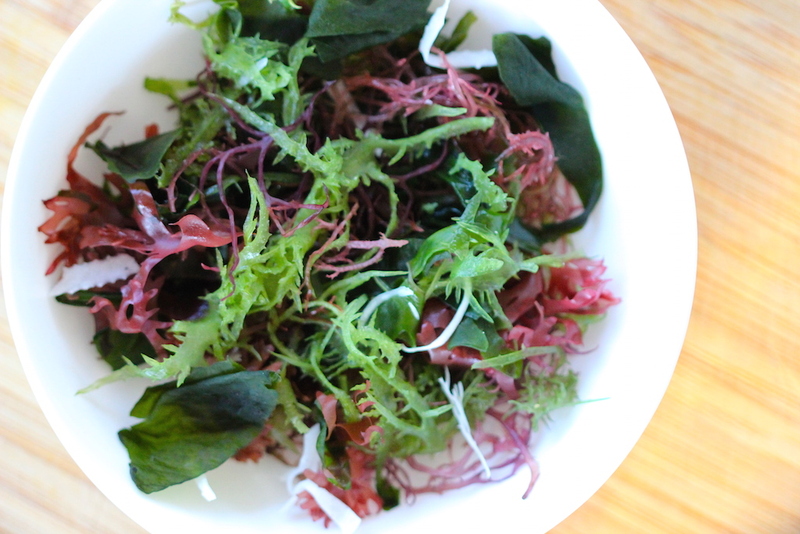 Combine all the dressing ingredients in a small bowl and whisk. Adjust seasonings to suit your taste. 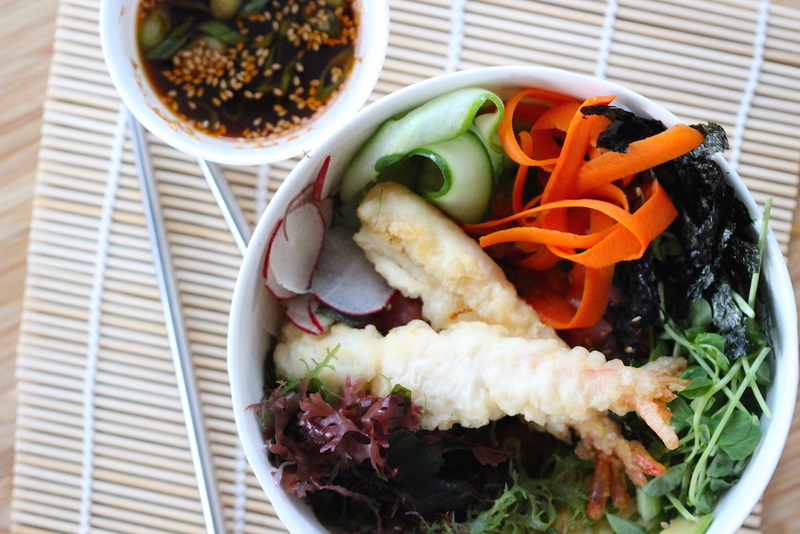 Build your bowl by starting with placing the rice on the bottom, followed by the greens, then arranging all the toppings clustered in their own groups or mixed all together. Pour the dressing on top just before serving. You can mix the entire bowl or simply eat as they’re arranged. Yes so happy to be back! Last year has been insane and busy. Now that I have my time back I can’t wait to share all these wonderful recipes I have planned out! YAS!!!!!! You had me at tuna! I live a block away from an Asian market (ugh so bad but so good). Picking up all of this stuff this week and making! Count me in! I will want to try this, and I hope soon. Richard will thank you, too! Just heard today that my dad is going with a friend of also-Norwegian-roots to do a little family origin scouting in Norway next May—who knows but what Dad will find out we’re related to your Wold guy when he digs around there, eh! That’d be a kick. 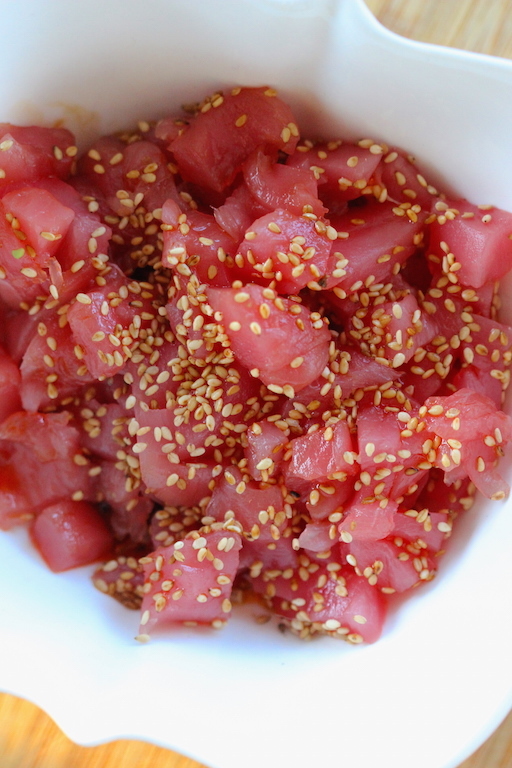 But back to the sushi bowl…. Did you make your own tempura for this? Impressive. I’ll probably try using quinoa rather than rice, since Richard’s finding that rice is harder on his blood sugar (thank you, mean ol’ hereditary diabetes) than many other starches, but I think the texture will work nicely anyhow. And I have masses of nori we got as a gift not long ago. I’m starting to salivate just thinking of all this goodness. Thanks for the inspiration!